Tim Searchinger is a research scholar at Princeton University. Wolfgang Lucht is a professor at Humboldt University and the Potsdam Institute for Climate Impact Research. The authors are among the signatories of a letter by over 600 scientists to the European Parliament, who urged MEPs to amend a “flaw” in the renewable energy directive that would allow deliberately cutting down trees to burn them for energy. On 14 December, a number of world-renowned scientists warned that the present version of the Renewable Energy Directive moving through the European Parliament gravely threatens the world’s forests and climate by encouraging countries to cut down trees just to burn them as “renewable energy”, instead of burning only residues and wastes. More than 500 additional scientists, many with similar world reputations, are today sending a letter to the European Parliament with the same message. Yet also in December, a small group of bioenergy academics disagreed. They essentially argued that it is defensible to cut down trees to burn them so long as other trees in the forest or in the country are growing enough to keep the forests in balance. This is an intuitive and seductive response. However, the authors of the first piece, among them a former Chief Scientist of the United Kingdom, two winners of the US National Medal of Science, and prize-winning experts on global forests did not write casually. They understand well that trees grow and that a country’s forests contain many trees. But they find that, unfortunately, this argument for burning trees is both mathematically wrong and profoundly dangerous for climate change and biodiversity. Simple analogies explain the math problem. As a whole, EU companies are profitable. But this does not mean that an EU company losing money is also profitable. If I sit around and eat junk food all day, I am not healthy because most of my neighbours eat fibre and run five kilometres every morning. Similarly, those cutting down trees in one location to burn them do not help the world just because trees grow elsewhere. Without the cutting, there would be more trees and more carbon in the forest overall. It is true that cutting down trees today creates additional capacity for trees to grow on the same land in the future – in the way that emptying a bucket creates the capacity to refill it. But because burning wood is inefficient and trees regrow slowly, this refilling unfortunately takes decades to centuries even if the wood displaces fossil fuels. Under the present versions of the Renewable Energy Directive, most Europeans alive would pay more only to increase global warming throughout their lifetimes, and future Europeans would still face the potentially irreversible consequences of thawing permafrost and melting glaciers. In addition, the forest bucket is heavily depleted as a new paper in Nature just showed. The real challenge to rebuilding forests stocks is to reduce the effects of logging. Yet why would it be so bad to cut down trees so long as the carbon stocks in a country’s forests or the world’s forests remain stable overall? The answer from a climate perspective is that doing so reduces or eliminates the removal of carbon from the air that would otherwise occur and is now occurring through the net growth of the world’s forests. Known as the “forest carbon sink,” that growth is now holding down the rate of climate change. In fact, a major cause is climate change itself. Higher levels of carbon dioxide and warmer temperatures lead to more tree growth, and scientists already count this beneficial feedback in estimating future climate change. Reducing this sink by cutting down more trees adds carbon to the air and makes climate change worse just like burning any other carbon-based fuel. Increased forest growth is required to keep Earth from warming faster and therefore not a disposable extra. The mere fact that the carbon in forests is stored above and in the ground, rather than below ground like fossil fuels, provides no help. Roughly a third of the carbon humans have added to the air has come from vegetation and soils. And the remaining plants and soils hold enough carbon to cook the planet thoroughly if released, even without further combustion of fossil fuels. Requiring balance between a country’s forest harvests and growth would also allow the clearcutting of large areas of tropical rainforests. Because climate change is spurring faster growth of tropical trees too, many tropical forest countries can plausibly claim to have growing forests overall even as they clear millions of hectares of forests for agriculture. If the international rule is that cutting and burning forests in one place helps the climate so long as forests are thickening in others, then rainforest countries could cut down their trees too. European and US forests are also re-growing because of the decline of traditional bioenergy over the last century. As fossil fuels replaced the harvest and use of wood in factories and homes, our forests recovered. The fact that forests recovered after we reduced our harvest of wood for energy is hardly a reason to start burning wood again – particularly now that our energy demands are dramatically larger. Expansion of managed forests has also led to high carbon loss from draining wetlands. 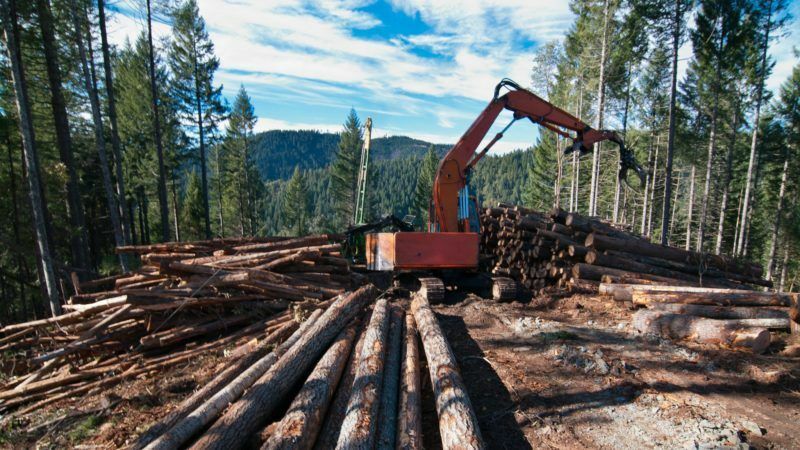 Regardless, because highly managed forests cannot meet even the world’s existing wood demand, more wood demand for bioenergy will ultimately have to come from natural forests somewhere in the world if only to replace wood from managed forests diverted to bioenergy. All the world’s annual, commercial wood harvest could at most provide around 3% of the world’s energy. Although the details of this one directive may seem like a small issue, the wrong vote would effectively launch a major new assault on the world’s forests. To avoid that, legislators should instead restrict the use of forests for renewable energy to the traditional sources of residues and waste. Fake news: the ‘scientist’ says that it is not the same to cut down trees to substitute fossil fuels, just because trees grow somewhere else. In Europe we account for the cut trees, in order to balance them with those regrowing. In Europe, we are not like the champions from US, we have the Kyoto Protocol and this is why we have growing forests. So much easy to dispel the biased ‘science’. @euractiv put some real science based news and do not report this kind of fake news. Or put a disclaimer. Euractiv is like Trump. It just publicates whatever…as long as it serves its funders interests. Dear Anders, as you may have noticed the authors are among a group of more than 600 scientists who sent a letter to the European Parliament urging them to refrain from adopting policies that would allow cutting down trees to burn for energy. Among them are university professors and a former vice-chair of the IPCC. Please look it up before throwing unsubstantiated accusations. I guess it is then better continue burning non-renewing black coal for energy, instead of burning wood in sustainable matter… Btw, Central-European countries that have destroyed their own forests centuries ago, could be forced to plant trees. That would be a great carbon sink. 1. The authors ignore the fact that young vigorous forests/trees are much more effective to absorb carbon compared to older, mature, and dying forests/trees. In average, the forests in Europe and North America are older and less vigorous than their optimum status for carbon absorption. Harvesting is less than gross growth; thus, the annual absorption is declining. Therefore, replacing old forest/trees with young vigorous forests/trees will increase the carbon absorption. The authors regard forests only as a pool of stored wood (carbon). They disregard the fact that forests/trees gradually will develop from sinks to sources, once the age factor, etc. leads to a situation when decomposing will release more carbon (CO2) than what is absorbed. 2. Using forest biomass for energy replacing fossil fuels means that the fossils are “kept in the ground”. The biomass would have decomposed anyway sooner or later and released its carbon to the atmosphere. With proper integration of biomass flows from forest management regimes, any possible time lag of emission (“carbon debt”) can be minimized or reduced. Like many previous articles, etc, by TS, this actual case consists of pieces of evidence of which several are irrelevant and/or outdated. Founded on these pieces and saturated with unprofessional assumptions, a model of “the true world” is presented. None of the authors have any deep experience and education in forestry, but it seems not to bother them. Their conclusions deviate a whole lot from results presented in reports based on evidence. However, they are using their prestigious positions to get credibility? What is needed in the actual field is more professionalism and less wise-cracking from quasi-experts. One should also consider the huge difficulties to store carbon in forest for a long time. Recent wildfires in Canada, Portugal, Spain, Croatia, California etc has shown that the carbon will in most cases be released anyway – while we are adding large amount of CO2 by using concrete instead of wood, plastic packages instead of paper and burning coal instead of waste biomass. Historically wildfire occured as frequent as every 30th year. With climate change this frequency is likely to increase, as are severe storms and also insect attacks. Not using forest and instead using fossil fuels hence leads to almost the same emissions from forests – but aditionally huge emissions from the fossil fuels that forest products were to substitute.